This wall constitutes a psychological barrier between us. A barrier of suspicion. A barrier of rejection. A barrier of fear of deception. A barrier of hallucinations around any action, deed or decision. A barrier of cautious and erroneous interpretations of all and every event or statement. It is this psychological barrier which I described in official statements as representing 70 per cent of the whole problem. Sadat’s visit has been hailed as a turning point in Middle Eastern relations, but nearly 40 years later these barriers are still in place, and possibly even more fortified among some communities in this contested land. The years of 2000 and 2005 witnessed two Palestinian intifada, or uprisings, that led to violent clashes and further rounds of recrimination. The Gaza war in the summer of 2014, in which thousands of Palestinians died, and a spate of stabbings of Israeli civilians by Palestinians, ensured that the Arab–Israel conflict remained among the most high-profile of the world’s intractable conflicts. Persisting for decades, such conflicts have proved resistant to traditional diplomacy, mediation and negotiation. Other notable cases include India and Pakistan’s 50-year standoff over Kashmir, and Colombia’s 50-year battle between the government and the rebel group FARC. Attempting to untie the Gordian knot of the Arab–Israel conflict, with its intertwined threads of history, politics and religion, might seem like a fool’s errand, requiring hubris and chutzpah in equal measure. Yet that has not dissuaded psychologist Eran Halperin of the Interdisciplinary Centre (IDC) Herzliya, on the outskirts of Tel-Aviv, from trying to find a way. ‘If psychology is the problem, then maybe psychology might also be the solution’, says Halperin. Part of the reason for the dearth of tried-and-tested conflict interventions is that for the past few decades psychologists have been more focused on working out what psychological processes fuel conflict, often in lab studies with undergraduates, than trying to tackle the messy conflicts that people get swept up in. Halperin, who grew up in the context of Israel’s violent conflict, began his path towards psychological interventions working with his PhD supervisor Daniel Bar-Tal, now emeritus professor at Tel-Aviv University, on what they called the socio-psychological barriers to peace. Bar-Tal had spent the previous decades characterising the cognitive and emotional basis of these barriers, and how they jointly help sustain an ‘ethos of conflict’ that keeps all sides locked into cycles of distrust, violence, hatred and despair. As a post-doc, Halperin moved to Stanford University to work with influential social psychologist Lee Ross, who had also been studying the cognitive biases that fan the flames of conflict. In the 1980s Ross, working with Stanford colleagues Robert Vallone and Mark Lepper, had described what they called the ‘hostile media effect’. In one study pro-Israeli and pro-Palestinian students on Stanford campus watched the same news coverage of the 1982 massacre by a Christian Lebanese militia of between 800 and 3500 civilian refugees, mostly Palestinians and Lebanese Shiites, in the Shabra neighbourhood of Beirut and the nearby Shatila refugee camp – an atrocity that many people claimed the Israel Defence Forces had allowed to unfold before their eyes. The students were then asked about the news reports they had seen. Even though all students had watched exactly the same footage, both pro- and anti-Israeli students perceived the coverage to be biased against the group they sided with. One consequence of naive realism is that we often make negative inferences about people who make different choices to our own, as it seems that they must be either acting irrationally, given the objective pros and cons of the decision in question, or simply do not have an accurate picture of reality, like we do, and therefore choose differently. More generally, when people disagree with us, especially on some contentious issue, we think they must be biased. ‘If I think the world’s black and you think it’s white, and someone comes along and say it’s grey and complicated, we both think that person is biased or unfair to our side,’ says Ross. a married couple rather than specifically relating it to the Israel–Palestine conflict. Participants then read about Israeli and Palestinian views on three historical events – the 1948 War, the 2000 Camp David Peace Summit, and the 2008–2009 Gaza War – and were then asked a series of questions that gauged how open they were to the other side’s view of things. Compared with control groups, those who went through the naive realism manipulation showed greater openness to the other side’s narrative. But not everyone was affected equally, just as the researchers anticipated. Among Jewish Israelis, ‘doves’ on the political left – who are typically already open to the Palestinian narrative – showed little change; conversely, the narrative-opening effect of the intervention was greatest for more ‘hawkish’ individuals on the political right. Similarly, among Palestinians, those most committed to an ethos of conflict showed greater change in their openness compared to their more peace-seeking peers. The value of this approach has also been demonstrated in a series of studies directed at shifting beliefs about the possibility that people can change their ways. Take the old saying ‘A leopard never changes its spots’, which captures the widespread belief that the way people have acted in the past predicts how they’ll behave in the future. Psychologist Carol Dweck of Stanford University calls this belief a ‘fixed mindset’, which she contrasts with a ‘growth mindset’, the belief that people can instead grow and change. Dweck describes these mindsets, which may not be explicitly articulated, as ‘implicit theories’ of personality, and for the past few decades she’s been studying how they affect behaviour and motivation. In one particularly influential strand of research, Dweck has shown that children with a fixed mindset are less likely to persevere with academic tasks when the going gets tough, because they interpret their temporary struggle as a sign that they don’t have what it takes to do well – and if you can’t change this, why keep trying? Children with a growth mindset, on the other hand, often see difficult tasks as a welcome challenge and a chance to grow (Dweck, 2006). The good news to have come out of Dweck’s earlier research is that whatever people might think about personality and change, mindsets themselves are not set in stone. A growth mindset can be nurtured, for example, by presenting kids with information about how the brain changes as we learn, and how our intelligence and abilities are not fixed at birth but are malleable. So in recent years, Halperin has been working with Dweck to explore the role implicit theories about personality play in maintaining violent, intractable conflict. After all, in situations in which both sides in a conflict can point to misdeeds carried out by the other, a fixed mindset severely imperils the prospects of progress towards peace – why reach out to the other side, or offer concessions and compromises, if your adversary will simply take advantage of this gesture and then carry on as before? A series of studies reported by Halperin and Dweck in 2011 confirm that this is exactly what happens when people have a fixed mindset (Halperin et al., 2011). In the first study, a nationally representative sample of Israeli Jews were interviewed by phone to assess whether they had a fixed or malleable mindset regarding the ability of groups to change (without specifically mentioning Palestinians), by asking them how strongly they agreed with statements like ‘As much as I hate to admit it, you can’t teach an old dog new tricks – groups can’t really change their basic characteristics’ and ‘Groups that are characterised by violent tendencies will never change their ways’. In addition, the respondents were quizzed about their attitudes towards Palestinians and willingness to compromise for peace. Halperin and Dweck found that people of a more fixed mindset were more likely to agree with statements such as ‘All Palestinians are evil by nature’, ‘All that Palestinians really want is to annihilate Israel’, and ‘Palestinians should never be trusted’. They were also less willing to compromise for peace – for example, they showed less support for territorial concessions with Palestinians based on the 1967 borders and less endorsement of shared sovereignty over holy places in Jerusalem, or were less likely to advocate more active conciliatory initiatives by Israelis. Next, Halperin and Dweck set about seeing whether mindset could be influenced to foster attitude changes in peace-promoting ways. To find out, they recruited 76 Jewish-Israeli undergraduates, who were then told they would be performing a reading comprehension task, which was in fact an experimental manipulation, followed by some questions about Israeli society. For the reading comprehension task the researchers had invented two versions of an article that summarised studies on the behaviour of violent groups over time, although without specifically mentioning any of the parties in the Israeli–Palestinian conflict. One version, read by those in the malleability condition, argued that the behaviour of violent groups changes over time, and that their violence is often driven by extremist leaders and other contextual factors. The other, designed to foster a fixed mindset, claimed the opposite, that violent groups do not change, and pinned their aggressive behaviour on the nature and culture of these groups. Participants in both conditions then completed the survey on Israeli society, which was really cover for asking questions that, as in the first study, tapped into attitudes towards Palestinians and whether it was worth compromising for peace. In line with previous results, priming Israeli Jews with a malleable mindset improved attitudes towards Palestinians, and also their motivation to seek peaceful solutions through compromises. These findings were echoed when Halperin and Dweck ran the same study with Palestinian citizens of Israel, who make up roughly 20 per cent of the population, with a slight modification of the wording: instead of talking about the possibility of violent groups changing, this article focused on oppressive and racist groups (though without explicitly mentioning Israelis). Again, inducing a malleable mindset promoted more positive attitudes towards Israeli Jews and greater willingness to compromise for peace. Remarkably, the same findings were replicated among non-Israeli Palestinians, many of whom were members of militant groups like Fatah and Hamas – sworn enemies of Israel with little stake in the state’s future. In the past few years, Halperin and Dweck have expanded on these early results, and extended them to other conflict settings. In a similar study, they showed that among Greek and Turkish Cypriots – two communities also locked into a decades-long, sometimes violent conflict – belief in the malleability of group behaviour in general leads to lower levels of anxiety at the prospect of mixing with members of the other side, which increases motivation to make that contact happen (Halperin et al., 2012). Other studies suggest that it’s not even necessary to make people change their beliefs about group behaviour to promote peace. Recently, Halperin, working with Smadar Cohen-Chen of Northwestern University, Illinois, and Richard Crisp of Aston University in the UK, has shown that, among Israeli Jews, the more general belief that the world is a dynamic, changeable place fosters hope, and a greater enthusiasm for making peace-building concessions. As in previous studies, the researchers induced beliefs about the fixedness or changeability of the world by having participants read fictional summaries of research on social and political dynamism, without any mention of conflicts in general or the Israel-Palestine case in particular (Cohen-Chen et al., 2015). Other recent results suggest that mindsets may also be the key to creating something lacking but much needed in all conflicts, especially deeply entrenched ones: hope. People with a more malleable mindset have more hope that peace is possible, and inducing this mindset fosters greater hope. What’s more, these studies have shown that hope mediates the link between a malleable mindset and greater support for peace-building concessions (Cohen-Chen et al., 2014). Along with hope, forgiveness is also often in short supply when groups have been fighting and killing each other for decades. Political leaders sometimes make apologies on behalf of their collective constituencies, but, as welcome as they are, they frequently fail to lead to genuine forgiveness. Forgiving an enemy for their past misdeeds implies that they’ve changed their ways and won’t simply repeat what they’ve done in the past. And in a recent study, Halperin and colleagues found that Israelis who view Palestinians as an immoral outgroup were more receptive to an apology from Palestinian leadership after being induced into a more malleable mindset (Wohl et al., 2015). Many of the interventions developed by Halperin and colleagues indirectly change the emotional attitudes of people locked in conflict by first changing their more general beliefs. Others, however, target emotions more directly. Working with Stanford’s James Gross, an expert on emotion regulation, Halperin has been looking at ways to dampen down the emotional reactions – grief, fear, anger, hatred – that fuel enmity and feed into cyclical patterns of blame, revenge and continued fighting. Halperin and Gross have largely focused on ‘cognitive reappraisal’ as a means of preventing negative emotions from arising in the first place – or at least reducing their magnitude. Cognitive reappraisal has been shown to be effective as an emotion regulation tool in a range of settings, and Halperin and Gross have now extended this to the conflict arena. In an early study carried out during the Gaza War of 2008–2009, they found that among Jewish-Israelis the tendency to spontaneously engage in cognitive reappraisal correlated with support for providing humanitarian assistance to Palestinian citizens in Gaza (Halperin & Gross, 2011). In further studies in which participants have either undergone reappraisal training or not, Halperin and Gross have found that the training increases political tolerance of Palestinian citizens of Israel by Jewish-Israelis after they’ve read text criticising Palestinians. As with previous interventions, the positive effect was largely seen among those to the right of the political spectrum, as those on the left were already more tolerant (Halperin et al., 2013). In a more real-world test of the cognitive reappraisal approach, Jewish-Israeli participants were recruited to receive reappraisal training (or not) one week before a controversial political event, the Palestinian bid to join the United Nations in September 2011. A week later, those who had undergone the training reported fewer negative emotions and more conciliatory attitudes towards Palestinians – an effect that persisted when they were surveyed again five months later, and that was mediated by decreased levels of anger towards Palestinians (Halperin et al., 2013). One of Halperin’s most novel and recent interventions has an unusual backstory. In 2009 singer-songwriter Leonard Cohen announced plans to perform in Tel Aviv and soon became the target of criticism amid calls to support a cultural boycott of Israel. Cohen resisted and went ahead with the show. But he decided to donate the proceeds to peace efforts, including the award-winning Parents Circle – Families Forum (PCFF), set up in 1995 by businessman Yitzhak Frankenthal after his 19-year-old son Arik, a soldier in the Israeli army, was shot and killed by Hamas. PCFF brought together Israelis and Palestinians who had lost family members in the conflict, and who through shared grief reached mutual understanding of each other. With the new money Frankenthal set up The Arik Institute of Reconciliation, Tolerance and Peace, with a plan to find new ways to change the mindsets of Israelis and Palestinians locked in a conflict mentality. He soon met with Halperin, and they began a collaboration to develop a novel anti-conflict intervention. Halperin and his academic colleagues chose a technique called ‘paradoxical thinking’ to unfreeze them from an ethos of conflict – and make them more open to ways to end it. Instead of trying to change people’s views by directly challenging them, paradoxical thinking gets people to alter their current beliefs by exposing them to absurd extensions of those beliefs. So someone on the hawkish end of the political spectrum who morally backs their side’s military actions in a conflict might become uncomfortable with their support if they encounter a case for further military actions that presents it as a good thing in itself – for example, as a way to keep acting morally. Working with an advertising agency, Halperin and his team developed a series of short videos that presented paradoxical messages. After carrying out pilot studies, a video conveying the message ‘We need the conflict in order to have the strongest army in the world’ was selected for a longitudinal study that recruited 161 Jewish Israelis (60 per cent right wing, 20 per cent centrists, and 20 per cent left wing). Participants watched the video every three or four days for a total of seven times in the month leading up to the 2013 Israeli elections, at the end of which they answered questions about the role of Palestinians in the conflict, and their own willingness to compromise for peace. The day after the election they were asked who they voted for, and a year later completed a short survey on Israeli–Palestinian relations. Meanwhile, a control group watched a short video promoting tourism in Israel. Repeated viewings of the paradoxical thinking video led participants to rate Palestinians as bearing less responsibility for continuing the conflict, which made them more willing to compromise for peace. These attitudinal changes translated into political action: viewers of the paradoxical message were more likely to vote for dovish parties while those in the control group tended to take the hawkish options. These effects were long-lasting. A year later, those exposed to the paradoxical message were more willing to make compromises on contentious issues at the heart of the Israeli–Palestinian conflict, such as the evacuation of settlements in the West Bank, demand for recognition of Israel as a Jewish state, control over Arab neighbourhoods in East Jerusalem, and the division of Jerusalem (Hameiri et al., 2014). Over the past year, Halperin and his colleagues have been focused on doing rigorous field tests of these interventions, with larger and more diverse samples. This work remains largely unpublished as yet, but Halperin says the results are promising. One study used the malleability mindset approach in a field intervention delivered to more than 500 Israelis and looked at the effect it had on their political views six months later. ‘We consistently find beneficial effects, even during times of ongoing violence,’ says Halperin. There’s no doubt Halperin has had great success in developing new and effective interventions for intractable conflict. But how can these be applied outside the psychologist’s lab? ‘This is the million-dollar question,’ says Halperin. So Halperin and his team at the applied centre have been working with a variety of NGOs, who spend their days trying to change attitudes on the ground. 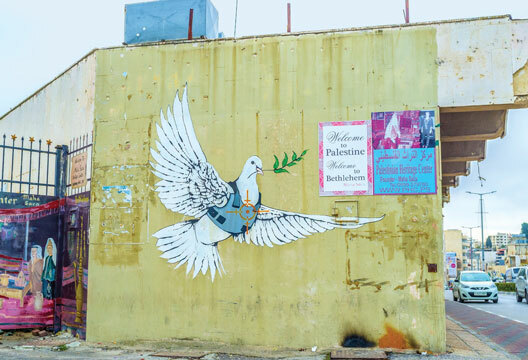 The applied centre regularly runs workshops for Israeli and Palestinian NGOs, where they learn about the latest psychological insights into conflict resolution. Afterwards, Halperin and colleagues meet with the NGOs every week or two and provide feedback on their projects that draw on the psychological research. - Dan Jones is a freelance writer based in Brighton. Cohen-Chen, S., Crisp, R. & Halperin, E. (2015). Perceptions of changing world induce hope and promote peace in intractable conflicts. Personality and Social Psychology Bulletin, 41(4), 498–512. Cohen-Chen, S., Halperin, E., Crisp, R.J. & Gross, J.J. (2014). Hope in the Middle East: Malleability beliefs, hope, and the willingness to compromise for peace. Social Psychological and Personality Science, 5(1), 67–75. Halperin, E., Crisp, R., Husnu, S. et al. (2012). Promoting intergroup contact by changing beliefs: Group malleability, intergroup anxiety and contact motivation. Emotion, 12(6), 1192–1195. Halperin, E. & Gross, J.R. (2011). Emotion regulation in violent conflict: Reappraisal, hope, and support for humanitarian aid to the opponent in wartime. Cognition & Emotion, 25, 1228–1236. Halperin, E., Porat, R., Tamir, M. & Gross, J.J. (2013). Can emotion regulation change political attitudes in intractable conflicts? From the laboratory to the field. Psychological Science, 24, 106–111. Halperin, E., Russell, A.G., Trzesniewski, H.K. et al. (2011). Promoting the peace process by changing beliefs about group malleability. Science, 333, 1767. Hameiri, B., Porat, R., Bar-Tal, D. et al. (2014). Paradoxical thinking as a new avenue of intervention to promote peace. Proceedings of the National Academy of Sciences, 111, 10996–11001. Wohl, M., Cohen-Chen, S., Halperin, E. et al. (2015). Belief in the malleability of groups strengthens the tenuous link between a collective apology and intergroup forgiveness. Personality and Social Psychology Bulletin, 41, 714–725.